My philosophy of work, as an early career professional, is to learn about a lot of varied topics, especially for helping me understand future situations in which I might find myself. So when this talk on professional resilience was advertised, I thought I would go along so that I could understand what this meant and see if I could learn anything to ensure I would be resilient in future. Emma began by unpicking the idea of “resilience”, as this is now a very loaded term. A lot of job specifications and interview questions are asking about a candidate’s ability to be resilient. The dictionary definition of resilience is the ability to recover quickly from something bad. For the visual learners in the audience, Emma displayed an image borrowed from Lisa Jeskins Training called the “Reservoir of Well-Being”. The image exemplified an average person’s emotional reserves, with the attendant descriptions of what could top-up your reserves but also what could drain them. The clear warning was that you might be drained to the point of burn-out if you do not keep your reservoir filled. One of the best ways to refill your emotional reserves is to “give time” to something you love, whether that is study, creative activities, being outdoors, or being around other beings. 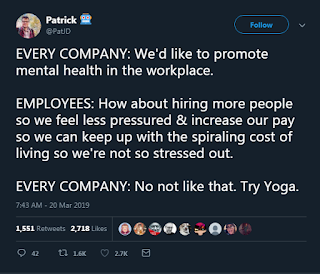 The key idea is that workplaces are not considering their role in burning out their workforce by demanding too much. Research in higher education acknowledges the many demands being made on the workforce without the benefits of previous generations and is asking whether HE institutions should be preparing students for this situation. Emma recommends pushing back against this by asking “is this the right approach?”. Though those who currently ask this are often considered disruptive, Emma implies that nothing will change unless such questions continue. 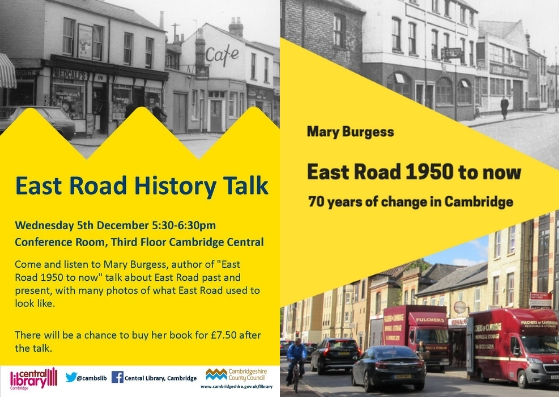 Emma then related a story by Emily Rogers from the book The Self as Subject which detailed how a professional librarian was broken by the lack of respect for her time and the (in my opinion) inappropriate response of the institution she worked for. She was set on a “remedial” career path towards tenure after shouting at an academic colleague in a public area of the library, which Emily accepted, and which ultimately led to her becoming the head of the tenure committee of her institution. What this led Emma to note was that “low morale” workplaces are not necessarily generated by active bullying but also by negligence. What has come through in recent research on the subject is that a lack of acknowledgement of success and effort leads to low morale, which consequently leads to an inability to defend one’s self. Resolution of these situations is usually due to someone (often, you) leaving, but that can be difficult if the low morale is causing you to feel low self-worth, which then means you do not come across well in interview. Three main points really stood out for me. First was the really helpful idea of “giving” time. Though Emma had referred to it first in relation to the “Reservoir of Well-Being”, it was her clarification towards the end of her talk of the importance of this phrase in reminding one’s self that it is not selfish (as implied by saying you “spend” or “take” time) to care for your own emotional well-being. Second was her conclusion where she noted that she could not give solutions, as solutions that do not work lead to further feelings of low self-worth. 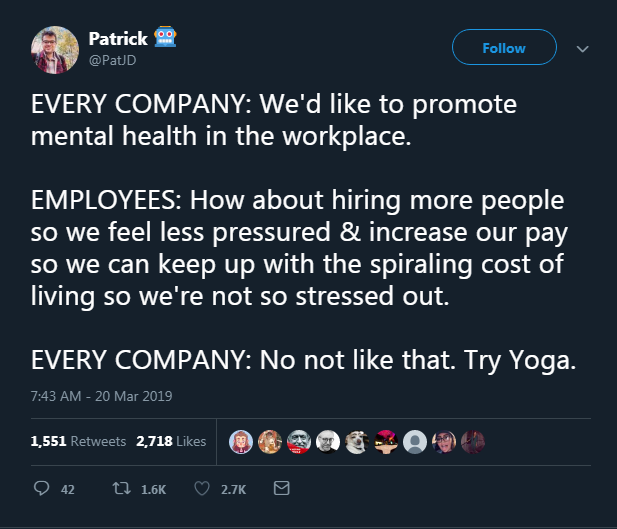 This was something she wanted to avoid and it fit with the idea that there is no one magical way to counter a low morale environment. Third was a response to the question of what recovery from a low morale situation might look like. This was intensely personal to me, as it turns out I am recovering from the low morale situation of completing a PhD. What spoke to me most was her point that to some it might sound like “compulsive bitching”, but repeatedly telling your story helps you come to terms with what happened, helps you get distance, and helps you regain agency over the situation. She also mentioned that this could take from one to two years at least, so I expect that anyone who asks about my PhD in the next 18 months will hear my story, but just know it is because I am trying to recover my resilience! Emma had concluded her talk by offering a few tools and tips for improving on low self-worth, all of which supported Jane Kenyon’s notion that you should “[b]e a good steward of your gifts”. She especially encouraged us to do at least one thing we love by Sunday and I would echo her by saying you should do at least one thing you love by the end of the week in which you read this blog post! 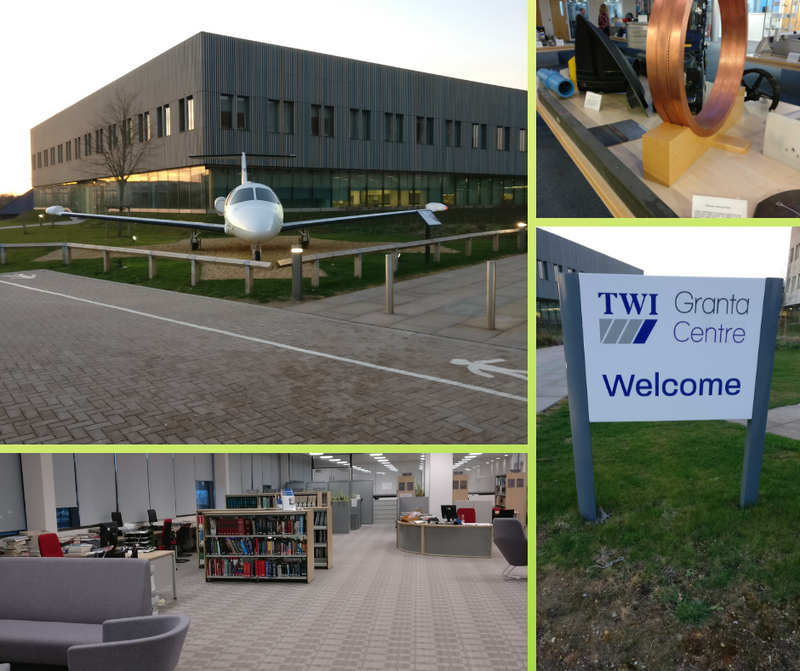 On Wednesday 20th March 2019 a group of 10 of us set off after work from Cambridge to Granta Park to visit the library at TWI Ltd at the invitation of Alison Chew, a fellow CLG member. The Library team at TWI (The Welding Institute) comprises six, soon to be seven members, a mix of both librarians and information scientists. TWI has approximately 950 staff and just over half of them are engineers. 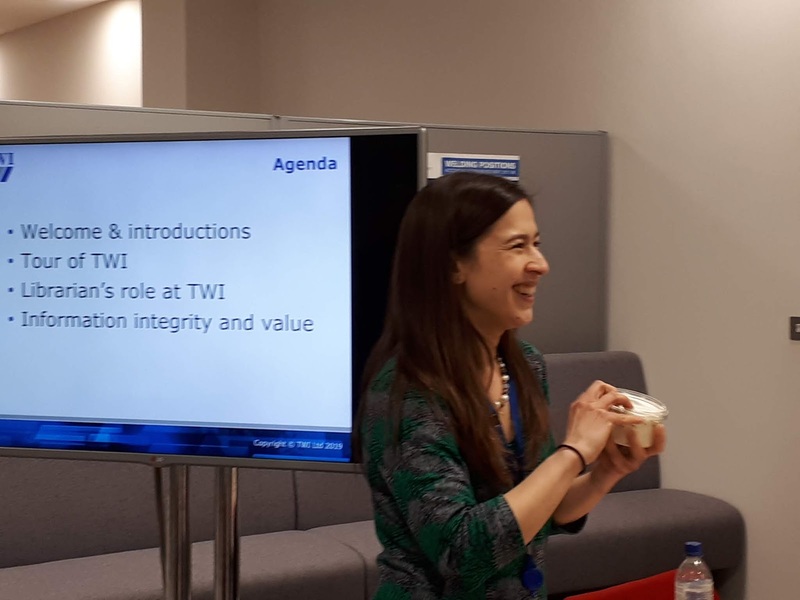 TWI – a non-profit company - has been based in Cambridgeshire since 1946, the first spin-out from the University and based originally in Abington Hall, where the sheds in the grounds were used for testing. Information Scientist Alison Chew and Paul Jones, Library Manager welcomed us to the library and gave us some insight into the work of the Institute and the role the library plays. There has been a library at TWI for over 80 years, and 30% of TWI income comes from publicly funded work. Standards take up two-thirds of the library budget with many written by TWI following testing processes. The library also plays a large part in the current NSIRC programme supporting 530 Master and PhD students over 10 years, and there is a shared programme with other Innovation Centres and Universities exposing students to Technology Readiness Levels (TRLs). We toured the Exhibition space, showing the huge variety of welding, which was quite a revelation. Apart from metal welding which is the first thing that springs to mind, we saw examples of the technologies used to weld composites to metals, such as electron beam Surfi-Sculpt. This is a bit like metal Velcro and can be used for joining metal to composite, such as on a racing car. Basically if something has a join in it, it will have been manufactured using a specific sort of weld, so we saw examples on of welds attaching metal to bone (in replacement hips), or fabric joins in a high-performance swimsuit! We saw videos of lasers being used to cut things up at the end of life – such as decommissioning of nuclear plants, where a robotic laser arm can operate with a high power beam density, and little contaminating fumes. We were also shown a timeline charting the history of TWI in The Street - which stretches the length of a wide corridor with room to expand, promoting a good deal of exhibition space envy amongst our visiting group! Back in the library, Alison explained about Weldasearch the which has been going since 1960 and houses in excess of 240,000 records. It is a unique and valuable resource, but very labour-intensive. The database is externally hosted with librarians as editors and a team of external abstractors. Weldasearch commands a high level of trust, with complete, accurate and unbiased results compared to online search engines, and the library maintains a thesaurus of keywords used in abstracting. An important part of the library’s work is to understand what the enquirer is trying to achieve, and the search and source expertise of library staff is invaluable here. Library staff try to capture the true value of information by asking questions such as “did this enable you to develop your proposal?” or “Did it lead to you getting funding for it?” Every member of the library team supports an industry sector such as the power sector. They do a lot of 1:1 information literacy training with staff and student groups, and go out to work in different sections of the building. They are doing more information searches than ever, but don’t have the budget to purchase all the full-texts that exist. There is a huge emphasis on copyright and intellectual property. There is a publications policy to make sure that TWI retains the copyright on papers written whilst someone is working there. All papers have to be validated through the library before presentations and there is no open access policy. A huge thanks to Alison and Paul for making us so welcome and for hosting our visit. It was interesting to see the difference between a library such as this and a purely academic library, but also to see the way the commercial and academic combine and complement each other. Alison Chew, information Scientist, TWI Ltd.
From the comments and conversations that flowed way past the evening itself, we would like to thank Nick Poole (@NickPoole1) for a thoroughly enjoyable and engaging talk, taking us through the changes to our profession and how CILIP is meeting the challenges these bring. A full transcript of Nick’s talk is freely available on the CILIP website and you can explore the #CamLibGroup tweets to follow the conversation further. As is customary for all CLG speakers, the committee like to present our presenters with a thank you gift and upon request we would like to thank Nick Poole with a donation to his chosen charity – the ECHO Refugee Library, a mobile library and education hub for teenage and adult asylum-seekers currently stranded in Greece. ECHO Refugee Library operates under the umbrella of ECHO for Refugees - a UK registered charity (Registration No. 1178189) and you can find out more about their amazing work in the link below. It was great to see so many new and returning faces and hope to see you at another event soon. 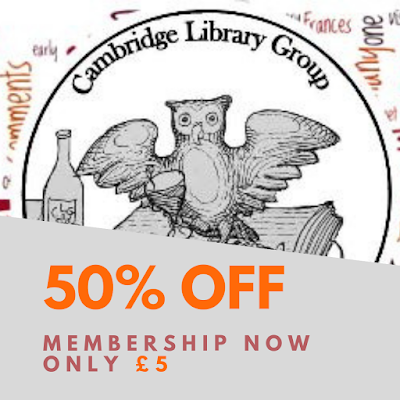 Don’t forget our Spring Sale where membership to the CLG is now half price at only £5 for free entry to all events until the end of July! How do you join, you ask? Just pop along to our membership page below and we will be happy to welcome you. Don’t forget to keep the conversation going and to find out more about CILIP take a look at the CILIP East Members' Network for CILIP members in the East of England who promote continuing professional development and hold events throughout the year. 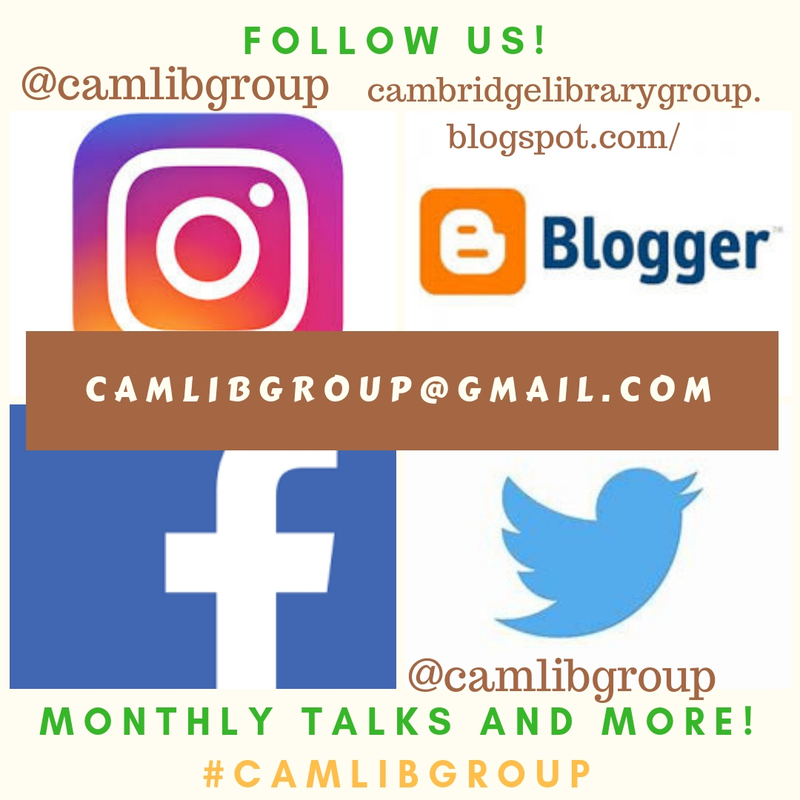 Be the first to find out about our monthly events! Breaking news! You can now follow the monthly magic of the CLG on Facebook and Instagram. 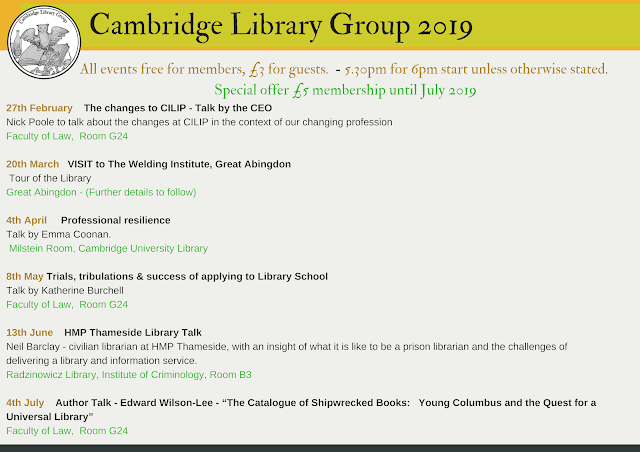 All welcome to join us for monthly talks and events on all things libraries, books and much more. With our Spring Sale now on this is the perfect time to take a look at our fantastic programme for 2019 and join us for just £5 until the end of July. Find us on Facebook Twitter or Instagram and come along to join us for an event soon! The CLG New Year Sale! 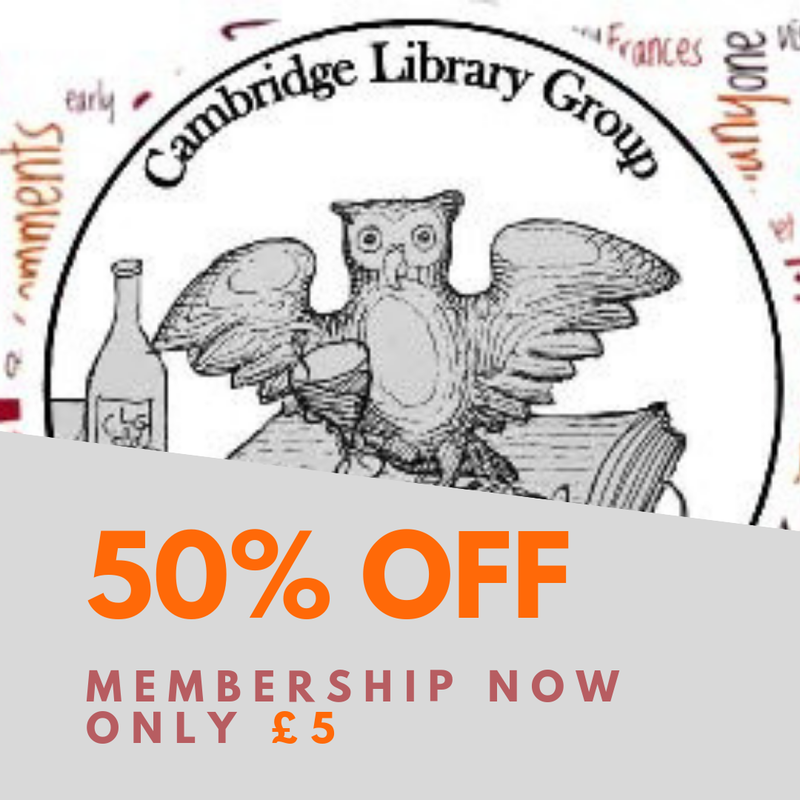 Make 2019 the year you join or re-join the Cambridge Library Group and no time is better than now with our half price membership offer. Just £5 to join with 6 exciting events lined up. 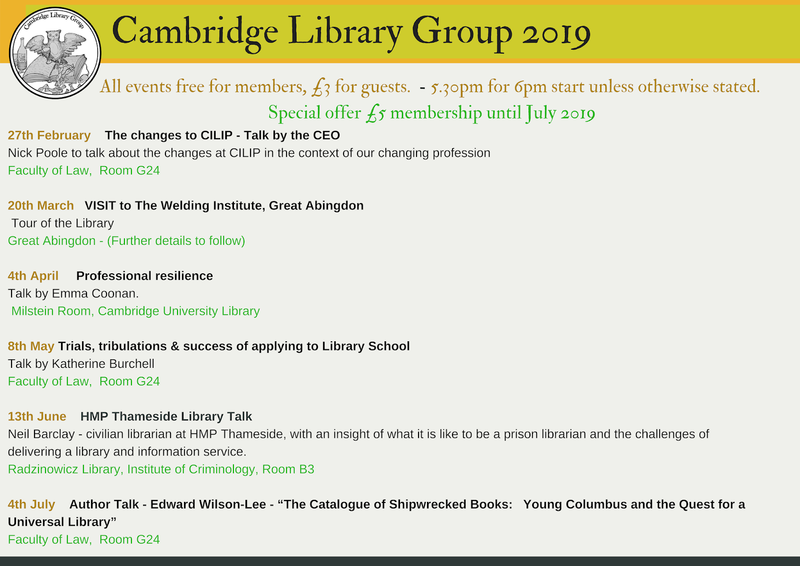 Don’t miss the first talk of the year where we are delighted to welcome CEO, Nick Poole to talk about the changes at CILIP in the context of our changing profession. 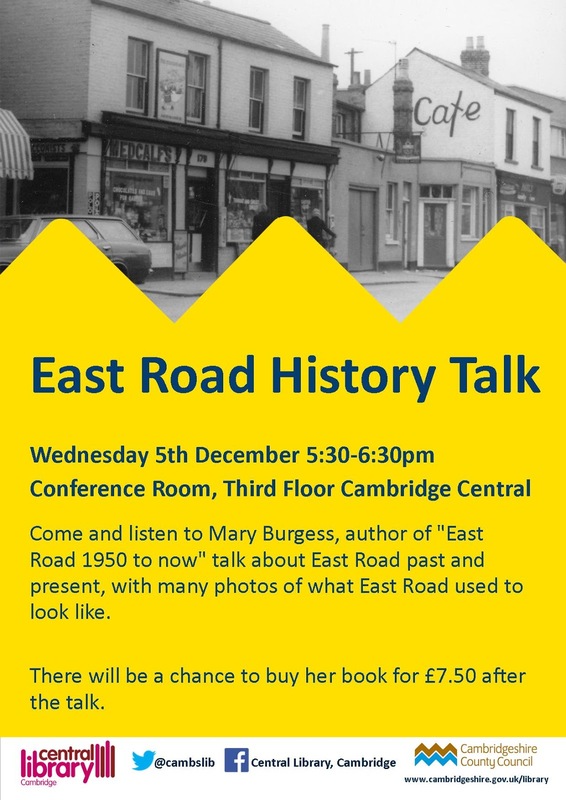 This event will start at the slightly earlier time of 5.15pm for refreshments followed by Nick’s talk at 6pm and is offered at a special price of £1 (free to members). All Welcome! Date for your Festive Diary! To start off November we were thrilled to welcome Steve Roud who gave us a fascinating introduction to the challenges of indexing traditional folk songs. At the beginning of his talk, Steve posed us with a question: How many ways can you spell the world ‘old’? It turns out in the world of folk song cataloguing the answer is an incredible 9 (so far), giving a small sense of the challenges involved in creating and finding records for these songs. Steve has been working for many years to create the Roud Folk Song Index, with an aim of indexing all the English-language folk songs in the world. 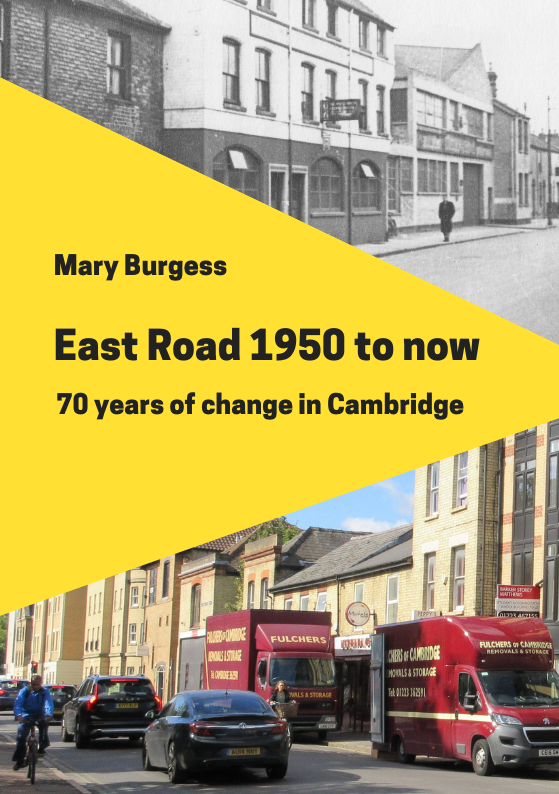 He was formerly a local studies librarian for the London Borough of Croydon, and brought this specialist knowledge and experience to his work on folk song cataloguing. He describes his interest in folk song and folk lore as a ‘passion’ and an ‘obsession’. He has published numerous books on these subjects. The folk songs Steve works with are not necessarily what modern audiences would associate with the term ‘folk song’; apparently defining folk song is a controversial area, but for Steve this typically means songs that predate recorded sound, by singers who are untrained amateurs, delivered face-to-face with no accompaniment. These attributes make folk songs a rich resource for social historians. Steve is not interested in modern folk arrangements, and he has a cut-off date of around 1950 when he is indexing. 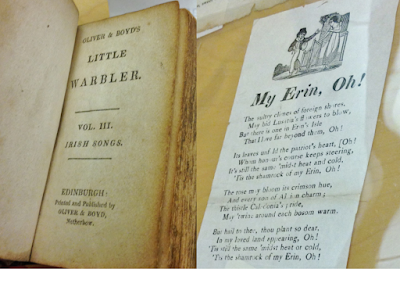 Folk songs are very ‘slippery’, which makes them extremely difficult to catalogue! Each time someone sings a song it will be different, so collectors often keep multiple different recordings. However, each recording might have a different name. Conversely, the same name might refer to 25 different songs. There are also issues of spelling to contend with; transcribers might imitate accents or follow spelling conventions of different dialects. In order to cope with these ‘slippery’ songs, Steve devised the system of Roud numbers, where the same number is given to every different version of a song. This system has proved extremely useful in the wider world of folk song, and recordings and song books are now typically published with Roud numbers. When Steve is indexing he tries to prioritise what the user will find useful over following international standards to the letter (a principle he started following in his work as a local studies librarian). His records include a title, but also a first line, which is often what users will remember. There is a difficulty when specifying the place a song is from, because people moved around and often travelled to London when recordings were made. Therefore, place collected really means the place the performer originated, as that is where the song probably came from. Steve also includes audio files where possible, which is especially helpful for any users who do not read sheet music. The songs he indexes might exist in any format, including manuscripts, books, journals, newspapers, photographs and sound recordings. The index he has created now has a staggering 250,000 records for songs (with a further 250,000 records for broadsides), all input by Steve. While folk song is seen as an oral tradition, Steve pointed out that it hasn’t been a purely oral tradition since the invention of print. 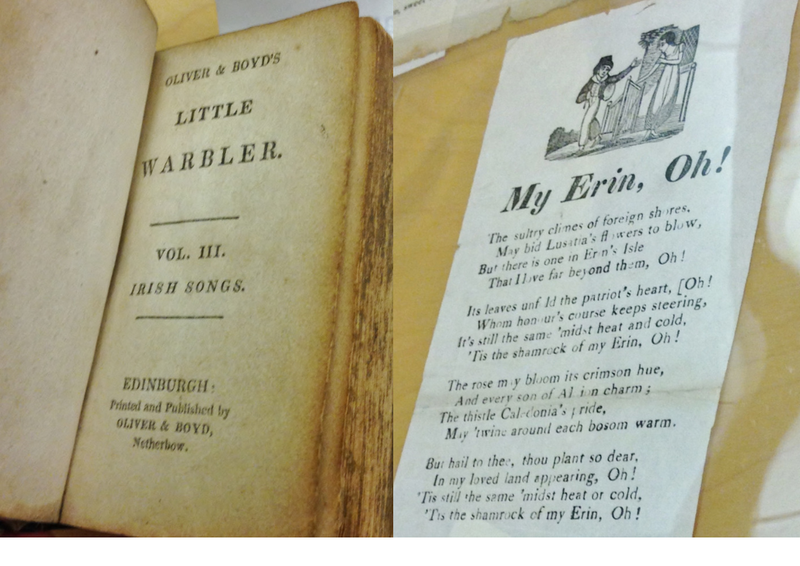 Broadsides containing words of popular songs could be bought very cheaply and were widely circulated, providing a much more tangible way to research folk song. Steve brought along some wonderful examples of broadsides for us to look at. Another wonderful treasure Steve showed us was a small scrapbook dating from the American Civil War. Entitled ‘The campfire songster’, it contains an individual’s collection of songs (some printed, some handwritten, and some with musical notation), which they presumably carried with them during the Civil War and sang with round the campfire. Steve’s index is a huge achievement which is of significant value to folk song enthusiasts and social historians alike. All were impressed by the obvious skill and dedication he has put into this project. Steve’s enthusiasm for this fascinating area made this a very enjoyable evening all round. 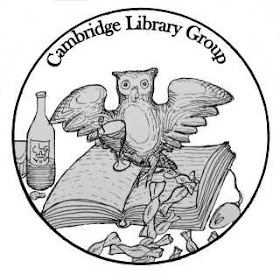 The Cambridge Library Group (CLG) is a society for those with an interest in books, libraries and information. Members enjoy a varied programme of talks, visits and social events at roughly monthly intervals.